Vanity Van’s team of mobile hairdressers and stylists are highly skilled at creating fabulous hair styles that leave you looking and feeling like a million dollars. We offer a comprehensive range of treatments, including extensions, hair cuts & styling. We deal with all hair types and styles. For event purposes we often recommend our 15 minute express dry styling, which could include styles such as straightening, putting hair up or curling. For more luxurious treatments we offer washing and wet styling with a full blow dry and finishing touches. We can also source wigs, hair pieces and extensions, including fun feather hair extensions and other similar products. Hair cuts and styling work really well at all events, particularly day long events, with a split between the day and evening activities. People also love our hair spruce ups at evening events. We can also theme the hair styling we offer to suit the type of event, for example vintage looks, 80’s themed hair styles and pop star looks; we can even create hair styles to look like animals. 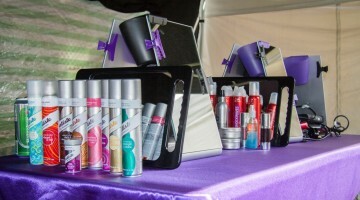 We use a wide variety of high quality hair products from companies such as Schwarzkopf, TIGI and Batiste. We can also source wigs, hair pieces and extensions, including fun feather hair extensions and other similar products.